Flameless candles are an amazing alternative to their traditional flame counterparts. Flameless candles are essentially that: flameless. 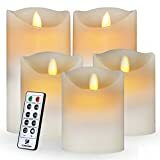 They can provide your house and rooms with the aura and comfort of a candle without the safety concerns that can come along with a normal burning candle. However, with so many options available on the market, which one is the best for you and your needs? 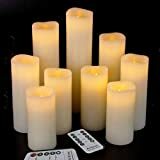 This guide will provide insight into the different kinds of flameless candles on the market to make your shopping experience much easier. Scented or unscented: Depending on your preference, a scented candle may be of importance. Flameless scented candles can release scents from their wax, but another type encompasses the use of fan technology to control the amount and strength of a scent. 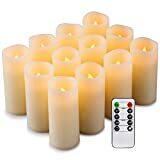 These can be great for freshening up a room, and some even have timers, which allow for even more control. 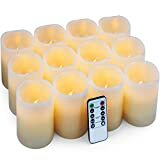 These scented flameless candles are perfect to put out when having company over, without having to worry about leaving them unattended. 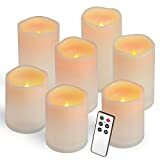 Color: Some flameless candles offer the option of a color-changing flame, something that traditional candles are not able to do. The color of the flame you choose can help add to the ambience of the room and the desired mood. 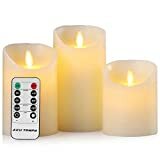 Power and Control Technology: Many flameless candles are battery powered, many using the standard AA batteries. An alternative to this would be to purchase one that is capable of being plugged in, and is therefore powered by your home’s electricity. Some models offer remote controls and have settings that allow for timers to be set, colors to be changed, and dimmers to adjust the brightness of the glow. Size and Shape: As with traditional candles, flameless candles come in many different shapes and sizes. Votives and tea lights are great for decorations and making a place feel comfortable and cozy. Larger sizes are available in jars and can be placed outside in any weather condition without worrying about whether the flame will blow out. Some models even offer insect repellant, which would be really helpful during hot summer nights. 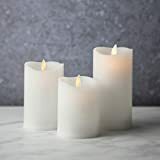 Ambience: Customers gave great reviews to those flameless candles that gave the feel of a traditional burning candle, such as the way the light flickers and gives off a subtle aroma. Remote Control: Customers were in love with those models that offered a remote control because they were able to set the various features to their liking and taste. Durability: Especially for those that can be recharged, it is important that the candle is able to “burn” for a reasonable amount of time before needing to be recharged. The materials that make up the candle should also be able to hold up to some degree of wear and tear. Scents: If you are a fan of scented candles, and are purchasing a flameless candle for its scent dispersing function - make sure that it is compatible with whatever form your favorite scent comes in, whether it is an essential oil, scented cones, or something else. 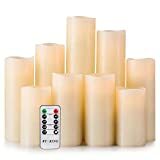 Accessories: Check out the accessories that might come with your flameless candle purchase - are they things you will likely use? Also check if your flameless candle can be further accessorised with things like a candle holder or stand. Control and Functions: Make sure that the flameless candle you purchase is suited to the needs of your home and the people living in it. 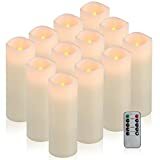 Perhaps a flameless candle with a timer would be very helpful if you or your family members tend to forget to switch devices off. Luminara has been selling top-notch flameless candles for years. Their collections include indoor, outdoor, and specialty candles, guaranteeing a good fit for any situation. Inglow prides themselves on their realistic wick design, which has been patented to ensure a true candlelight ambiance. 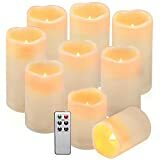 LED Lytes can provide your home with fun lighting through their multi-color flameless candles.